You can make energy saving improvements to your home without having to pay any costs up-front. You will need an up to date EPC certificate in order to qualify and apply. 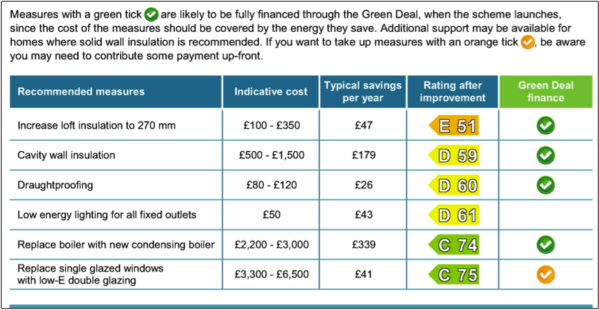 The EPC itself will automatically make recommendations as to energy saving measures that are specific to your home and which of these are available and financed through the Green Deal. An example of how these recommendations are shown within the content of an EPC is below. How the Green Deal works.